It's a dirty job, but someone has to do it. Luckily we have 3 very eager people that want to get the boat in the water and quick. 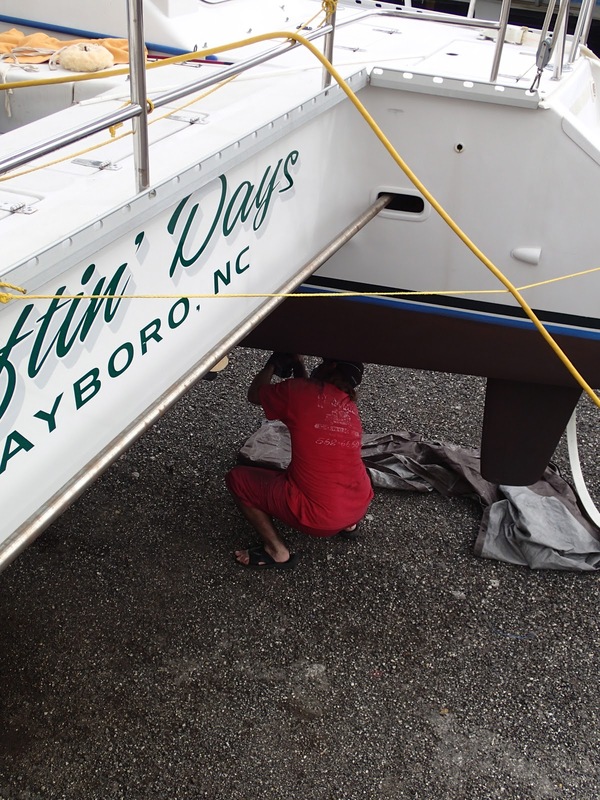 We are prepping the boat for new bottom paint today. 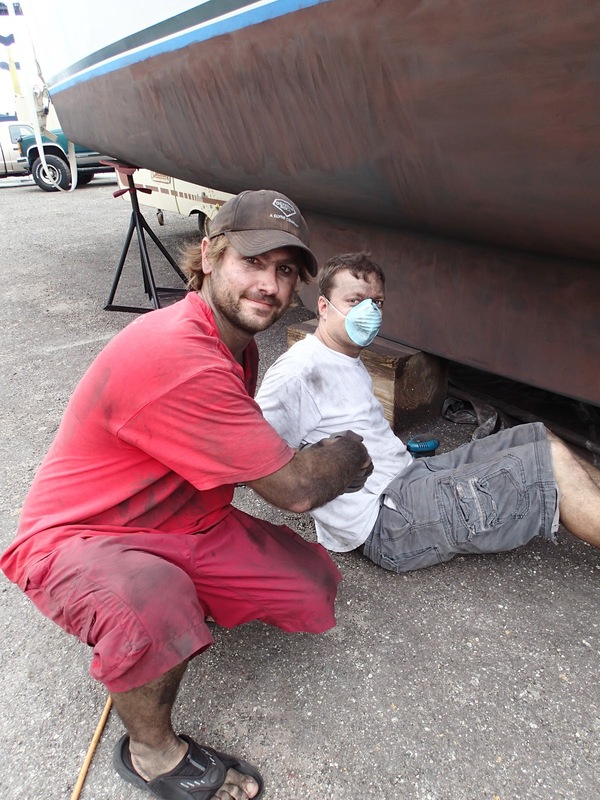 Mainly Dan and Preston are prepping the boat for paint while I run around town. They have the most convenient laundry mat / car wash here in Fort Pierce. I was able to throw my laundry in, move down a stall to wash the car and when I was finished with that I bounced back to the laundry mat to throw the clothes in the dryer. I then visited the local sign guy in town to get our boat signage made, picked up our special order paint from the local paint store, picked up the laundry, and then back to West Marine to get our gel repair kit for the keel. Made it back by 11:00am to help with the boat and this is what I came back to. Covered head to toe in black dust. Even after showering this evening Dan looked in the mirror and realized he had missed his neck. It was still completely black. Together they sanded both hulls, keels, and rudders. We are now ready to paint first thing in the morning. Hopefully we will splash Friday morning. I haven't mentioned the hotel we are staying in because..... well..... let's just say it's the only hotel that allowed us to let the dogs in the room. The staff is extremely nice and willing to bend the rules for us. There are signs all over the office saying, "NO PETS ALLOWED", "NO PETS NO MATTER WHAT", yet all I did was ask if they allowed dogs. She also gave us the weekly rate, even thought it has been completely obvious they are mostly an hourly rate kind of joint. We asked for a non-smoking room, but each night when we get back it smells like someone was just smoking in it. The walls have breaks and holes where it looks like a shoulder or head has gone through. Ohhh I almost forgot the best part. It seems someone was murdered between the 2 beds. That is why we weren't surprised when we noticed the lock you fold over the door has been ripped off the wall!!! We figure we are getting our money's worth. Preston's only requirement was a complimentary breakfast, which we got. I do think that next time he will be more specific as mini doughnuts don't qualify as breakfast in Preston's mind. Okay I did a little bit of work today too. Your "Hotel" sounds classic. What a story!! Good job Tara! That's the most important part anyway.